Property Info: 3 Bedroom, 3 Bathroom Property with 1700+ sq. ft.
Perdido Towers condo for sale in Perdido Key. Get away from the crowds in one of Perdido Key’s most desirable, low-density communities…completely reconstructed in 2006! This beautiful residence features floor to ceiling views and is directly beachfront with full boating facilities across the street! 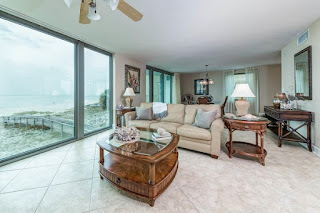 Those with attention to detail with appreciate the quality which abounds in this Perdido Towers residence that was completely reconstructed with impact windows and doors, modern kitchen and baths, crown molding and more! This residence is in immaculate condition with no detail overlooked and beautifully furnished! Spacious, open-concept living, dining & kitchen area with tons of space for entertaining the entire family! Those who love to cook will appreciate the kitchen with abundant counter space, loads of cabinet space and separate pantry and bar area. Plus a large, sweeping snack bar with plenty of seating. The private, gulf-front master suite features floor-to-ceiling windows which show off unobstructed views of the Gulf of Mexico...And the windows open so you can listen to the waves rolling over the shores of Perdido. Great split floor plan places the two guest bedrooms at the north side of the residence, each with ensuite bathrooms and access to a balcony. Perdido Towers owners and guests enjoy tons of amenities including gulf-front pool, tennis courts, recreation room with fitness equipment, and picnic area. Boaters will love the well-maintained boat dock (first-come, first-serve) with fish cleaning station plus boat launch and secure boat storage. Exceptional management and strong HOA. Truly a must see!